I ran a test yesterday. I loaded the always-online SimCity—the game that EA says just can't be easily made to run offline—and then pulled the proverbial cord. I switched off my Internet to see how long I could keep on playing. It didn't last long, but what I discovered intrigued me. 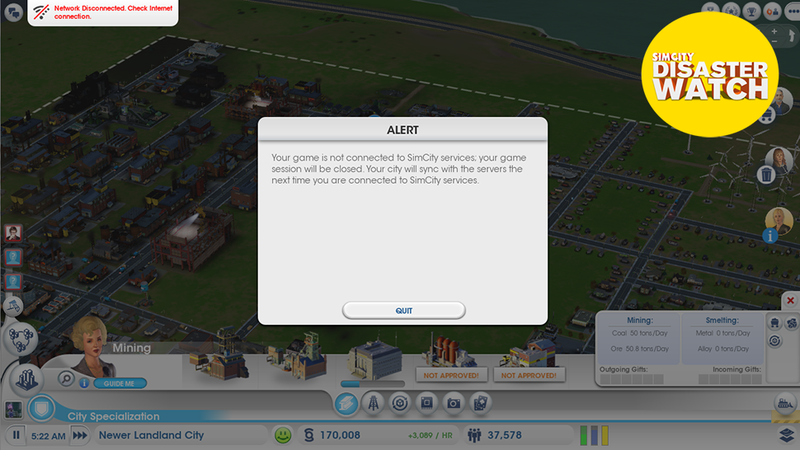 Prior to the official release of SimCity, I'd already seen that the game could run offline if a signal dropped. I play the game on a laptop (a powerful one!) and my WiFi signal at home isn't always so hot. So, when I was playing on a press server a few days before release, I'd get a pop-up indicator telling me the network connection was lost. I could keep merrily building my city, and, when the connection came back, there were no hitches. The folks behind SimCity have long maintained, however, that their game is made to be played online. That requirement isn't just DRM, they say. It's for gameplay—for simulating parts of the inter-city gameplay, for doling out challenges. They say this all the time, up to and including last Friday, when SimCity studio boss Lucy Bradshaw told the website Polygon: "With the way that the game works, we offload a significant amount of the calculations to our servers so that the computations are off the local PCs and are moved into the cloud." This, she explained, is why an off-line is currently a no-go for her team at Maxis. "It wouldn't be possible to make the game offline without a significant amount of engineering work by our team." The game has been running better and better this week. The new servers have made connections easy. So an offline mode isn't as direly needed. But, can this game, as it is designed, really not tolerate offline play? Yesterday, I tested this assertion. I started playing my city, the mining mecca known as Newer Landland City. I turned off WiFi and then tried to zoom out, check the region and zoom into one of the other cities in my region. Connection lost. Booted to the game's title screen. I turned my WiFi back on and returned to Newer Landland City (henceforth referred to as NLC). I laid down some roads. I probably zoned more residential, because my cities always need more residential. While I was doing this, I was running Microsoft Network Monitor 3.4, a program that scans your computer's network usage and shows which applications are talking to the network. You can run this, too, and probably should, because I'm not able to tell you a whole lot about the activity I saw. Most of it is Greek to me. What I can tell you is that SimCity.exe connected to Amazon IP addresses in Ireland—presumably Amazon servers used to network the game. For the most part, my game, running on North America East 3, connected to this IP address. Ireland servers? North America East? Who knows how this works! What I do know is that it seemed like my game was talking to the network a lot, several times a minute. If my city talked to the network that much, then, turning off the WiFi, I expected to see some catastrophes pretty soon. I could continue to lay down roads. I added a recycling plant. I upgraded it. Five minutes into being offline, I got a notification about a neighboring city. Fifteen minutes into being offline, I was notified that my garbage trucks had successfully serviced a neighboring city and made some money off it. The buildings in NLC seemed to be rising and falling just fine without the network. But what of my exports? NLC is a mining metropolis (well, more like a mining manor), and we export ore and coal. About 18 minutes in, my factories were full. My exports weren't going out. Because of the lack of an online connection? Or due to my mining facilities working overtime? I'm not sure, because, 19 minutes in, I got the alert you can see atop this story. The game had decided enough was enough. I had to quit to the main menu. I then restored my Internet connection, returned to my city and it successfully synched to the region. What if I had refrained from exports? Could my city have lasted longer? What if I had been playing at standard speed instead of triple-fast cheetah speed? My colleague, Mike Fahey, who runs an education city in the same region on the same server tried to repeat my test while playing at normal speed. He hit the same wall as I did in about 20 minutes. Last week, I posted the same question about the possibility of an offline mode to Bradshaw that Polygon and others did. Over the weekend, I got a reply. Me: "SimCity uses its online connection to connect player cities and support online challenges, but it seems clear now that some sort of offline mode would appease many fans. Is EA going to enable this option for the game?" Bradshaw: "Online connectivity as a creative game design decision was infused into the game's DNA since its inception and so we're fully committed to delivering against that experience first. A significant portion of the GlassBox Engine's calculations are performed on our servers and off of the player's PCs. It would take a significant amount of engineering work from our team to rewrite the game so that all of those functions are calculated locally without a significant performance hit to the player." I don't make video games. Maxis does. EA does. I can't tell how many things were going wrong in my city during the 19 minutes when I played it offline. I don't know how many calculations weren't occurring. And, for the record, I enjoy playing the game online with friends in my region. Those 19 minutes nevertheless provide a glimpse at an alternate to what we've been required to experience with the new SimCity. I've played an offline version of this game that looked great and seemed to run pretty well. Imagine if we could get more of that.